Indian weddings are vibrant, colourful, lively and amazingly beautiful. The age-old rituals which were guided by traditions expressed the beauty and sanctity of the occasion in many forms and ways. Though the changes in following the traditions has been observed in the present times but certain customs have evolved to acquire a new face which is still as significant as they were in the past. One of them is the mutual exchange of gifts. Earlier it was the guests who would bring gifts for the newlyweds and at the time they were leaving, the host would present them a box of sweets as a gesture of thanks for attending the wedding. 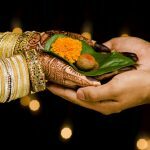 The same ritual has been remodelled to take an interesting twist where new ideas have flown in to make the Indian wedding a more happening and trendy occasion. Wedding Pouches have become a popular return gift which is given to the guests with a small token of something like a jewellery piece by the host. 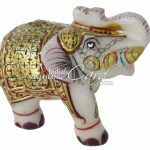 These beautiful looking potlis have Indian culture deeply embedded in them which displays itself in the form of ethnic designs and patterns. 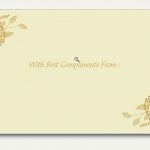 Indians are known to be the most hospitable hosts who love to invite people and shower them not only with love and warmth but also some token to appreciate their presence on their big day. It is considered to be good etiquettes to accept the gift graciously. These elegant pouches in the most innovative patterns steal the heart the moment anyone sets his or her eyes on them. Women feel extremely awe-struck at receiving such a thoughtful gift. 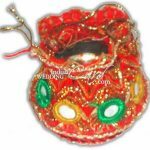 Wedding pouches are innovatively created and display their exquisiteness in their intricately woven designs embellished with beads, ribbons, lace or tassels. They are available in variety of fabrics like brocade, silk, organza, tissue, etc. These pouches in the form of potlis, showcase the vintage era in the most majestic and royal style. Undoubtedly, these pouches have become the trendiest of the gifts that are loved by the guests and cast an indelible impression of the host’s regal style. They never fail to make the wedding a grand affair. 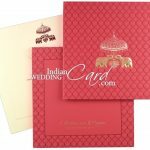 We at Indian Wedding Card proudly display the most alluring collection of wedding pouches which are not only extremely stylish but also splendidly voguish. 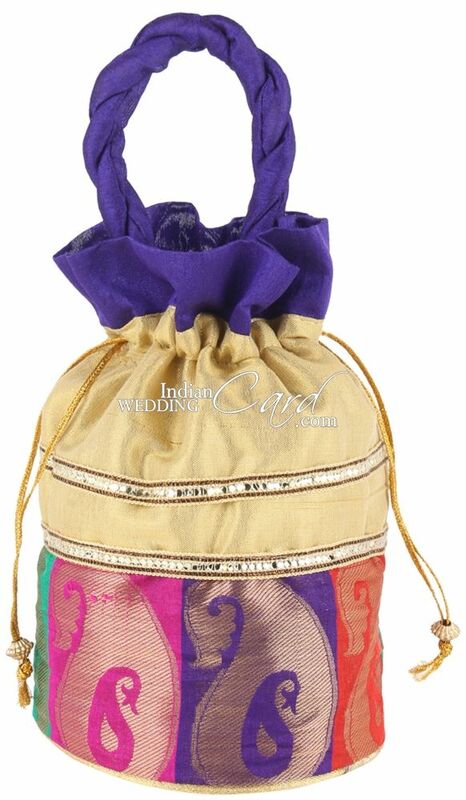 These pouches fall under the wedding favours category which is one of the most creative ideas as gifts for the guests. We take special care that these pouches are exclusive and display Indian art and craft at its best. 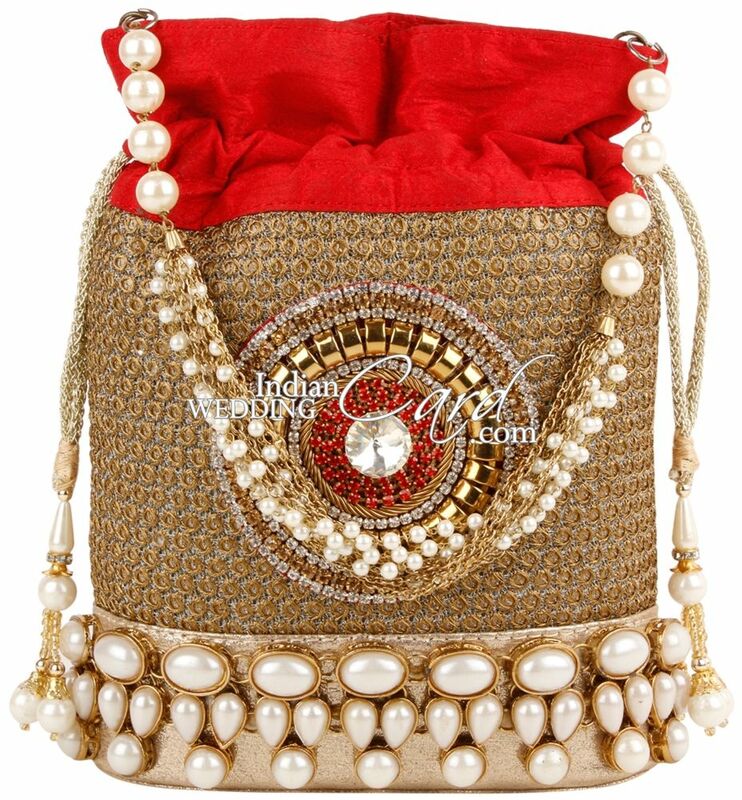 Our magnificent pouches are one of a kind and remain unparallel in fine hand work and designs. Our designers are always coming up with new and extremely unique pouches that are already a sensation everywhere. 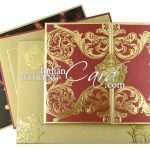 Our online store gives you freedom of choice as well as there is detailed description of our potlis to make your purchase a convenient one. 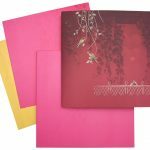 Our perfectionist attitude and always striving to go beyond the ordinary has made us one of the leading card designers and printers. Visit our online store and buy only what you consider to be extraordinary and uncommon. 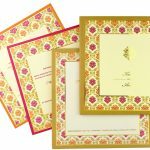 Are Indian Wedding Cards Any Different From The Rest?